A contingent of Brazilian soldiers belonging to the multi-national task force known as the U.N. Mission for Stablization of Haiti (Minustah) returned to Brazil on Friday after 13 years of occupying the Caribbean nation. Minustah, which was first established in 2004, is at the center of various legal battles due to their role in introducing the deadly cholera virus into Haiti in 2010, which resulted in the deaths of over 10,000 people. Furthermore, Minustah has been one of the largest sources of sexual abuse allegations for U.N. troop missions worldwide, accounting for about 25 percent of such allegations in 2013 and 2014. Separately, in 2015, some 225 Haitian women stated they had been sexually exploited in exchange for necessities such as food, water and medication by foreign mission workers. In an interview with Brasil de Fato, Guerchang Bastia, who represents the party of the Meeting of Socialists for a New National Initiative, discussed the devastating legacy carried out by Minustah on the Haitian people. "Minustah also committed violence against students, against the poor people living in the favelas, they raped women and men. They inflicted a lot of violence against the people including the introduction of Cholera into the country, "Bastia stated. The Minustah had their mission extended in 2010, after a devastating earthquake struck the country leaving more then 200,000 people killed. In the fall of 2016, six years after the cholera outbreak first began and continues to sicken people across the country, the U.N. finally admitted that it played a partial role in the deadly outbreak. During his interview, Bastia reflected on the police tactics carried out by the U.N. task force comparing it to the training and strategies used by the Brazilian military police in low-income urban areas of Brazil. Bastia went on to point out how the well documented massacre of 27 people in the Cite Soleil area of Port-au-Prince, served as a model for police tactics used by the Brazilian military police. "Brazilian soldiers killed many people in the favelas of Haiti. It makes sense, because Brazil also has poor urban communities. So for them, Haiti was a training ground where the could experiment with new strategies in police tactics for the poor people in their own country,” Bastia added. 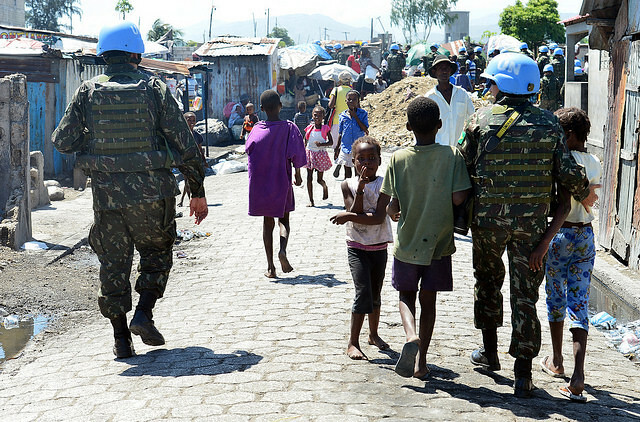 Meanwhile, in a recent radio interview with Brazilian military General Ajax Porto Pinheiro, he attempts make a distinction between the strategies employed by Minustah and the tactics carried out by the Brazilian Military Police, which in 2016, generated international condemnation after 920 deaths were documented in the city of Rio de Janeiro alone. Meanwhile, the Haitian people are scheduled to hold a People’s Tribunal, which is already partially underway that will examine and denounce the atrocities carried out under the U.N. occupation. “Institutional courts are about the law. However, the law has been created to benefit the ruling class. Our courts fail to take into consideration important issues. Take for example, the U.S. government’s role in the environmental destruction of our country. In Haiti, we do not have a law against this. The People’s Tribunal will make rulings based on popular judgement, which normal courts wouldn't rule on,” Bastia added. The People’s Tribunal, which was officially launched in 2016, also intends carry out political activities related to consciousness-raising and mobilization with regards to the violence of the UN occupation. The U.N. sanctioned military force of 2,370 soldiers known will end its operations in Haiti this October.